1 Chalet Hotel and 1 Half Board Hotel. WEsay Switzerland's overall most challenging skiing both on and off-piste. Some excellent chalet accommodation, and a magnet for party-goers and snowboarders. Verbier is a world renowned ski area enjoying a good altitude in a protected location in the middle of Switzerland's most southerly Alps. The vast four valley ski area offers 400km of runs and covers the villages of Thyon, Veysonnaz and Nendaz which are fast becoming popular in their own right. Strict regulation of building height and materials has meant that Ski Chalets in Verbier, and indeed all other accommodation types have kept their charm. The village centre has plenty on offer including some great nightlife as well as a good variety of shops, boutiques and restaurants. The much improved lift system will soon whizz you up to even the very upper slopes which offer spectacular views and (should you want it) some challenging runs and plenty of off-piste. 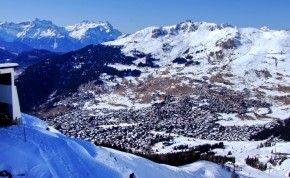 Novices have a selection of nursery slopes in the village centre and at Les Esserts. Cheaper day passes cover these areas and there is a local Verbier pass also for wider exploration. Intermediates will enjoy the Savolyres area with it’s uncrowded snowy pistes as well as the superb glacier skiing. 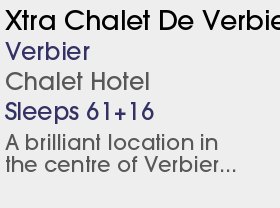 Verbier is world famous for its apres ski, it is trendy, cosmopolitan and always lively. Other activities include ice-skating, curling, indoor tennis, a heated indoor swimming pool, tobogganing, cinema, sauna/solarium, para and hang-gliding, cross country skiing and a beautifully designed sports centre equipped for most activities. The Mont-Gelé cable car, which serves steep off-piste runs only, was constructed in 1959 and has met the end of its legal life. So a new cable car of a similarly small scale capacity (45 people per cabin, 400 people per hour) is taking it's place. A new snowmaking system is being established in the Savoleyres sector. The slow chair lift at La Chaux is being upgraded to a six-seater chair, with its starting point closer to the bottom station of the Jumbo cable car to Col des Gentianes. The old gondola at Mayens de l Ours in the Veysonnaz sector is being updated to a 10-seater gondola, more than halving the ride time.